Water naturally brings a garden to life. 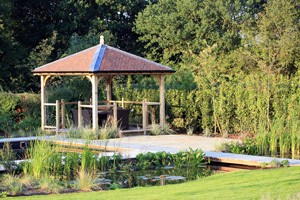 Whether it is a wildlife pond, a formal pond, a swimming pond or a natural swimming pool, it reflects light and introduces movement to the garden. Jill can help you to decide which is best for you. Natural swimming pools and swimming ponds are chlorine-free, so that you can swim in pure, clear water without any worries about the potential harm that may be caused by the chemicals used in conventional pools. By converting an existing swimming pool and introducing vegetation and wildlife, the pool can sit more comfortably in its surroundings, especially if the house is an old or listed building.